Another week, a few more financial terms to enhance your business vocabulary. Share is only fair, isn´t it? Please share this post. Journal | a chronological record of business transactions. Ledger | a record of business transactions kept by type or account. Journal entries are usually transferred to ledgers. Liabilities | amounts owed by a company to others. Current liabilities are those amounts due within one year or less and usually include accounts payable, accruals, loans due to be paid within a year, taxes due within a year, and so on. Long‐term liabilities normally include the amounts of mortgages, bonds, and long‐term loans that are due more than a year in the future. Liquid | having lots of cash or assets easily converted to cash. Marginal cost, marginal revenue | marginal cost is the additional cost incurred by adding one more item. Marginal revenue is the revenue from selling one more item. Economic theory says that maximum profit comes at a point where marginal revenue exactly equals marginal cost. Net worth | total assets minus total liabilities. Net worth is seldom the true value of a company. Opportunity cost | a useful concept in evaluating alternate opportunities. If you choose alternative A, you cannot choose B, C, or D. What is the cost or loss of profit of not choosing B, C, or D? This cost or loss of profit is the opportunity cost of alternative A. In personal life you may buy a car instead of taking a European vacation. The opportunity cost of buying the car is the loss of the enjoyment of the vacation. Overhead | a cost that does not vary with the level of production or sales, and usually a cost not directly involved with production or sales. The chief executive’s salary and rent are typically overhead. Post | to enter a business transaction into a journal or ledger or other financial record. Prepaid expenses, deferred charges | assets already paid for, that are being used up or will expire. Insurance paid for in advance is a common example. The insurance protection is an asset. It is paid for in advance, it lasts for a period of time, and expires on a fixed date. Present value | a concept that compares the value of money available in the future with the value of money in hand today. For example, $78.35 invested today in a 5% savings account will grow to $100 in five years. Thus the present value of $100 received in five years is $78.35. The concept of present value is used to analyze investment opportunities that have a future payoff. Price‐earnings (p/e) ratio | the market price of a share of stock divided by the earnings (profit) per share. P/e ratios can vary from sky high to dismally low, but often do not reflect the true value of a company. Profit | the amount left over when expenses are subtracted revenues. Gross profit is the profit left when cost of sales is subtracted from sales, before any operating expenses are subtracted. Operating profit is the profit from the primary operations of a business and is sales minus cost of sales minus operating expenses. Net profit before taxes is operating profit minus non‐operating expenses and plus non‐operating income. Net profit after taxes is the bottom line, after everything has been subtracted. Also called income, net income, earnings. Not the same as cash flow and does not represent spendable dollars. Retained earnings | profits not distributed to shareholders as dividends, the accumulation of a company’s profits less any dividends paid out. Retained earnings are not spendable cash. 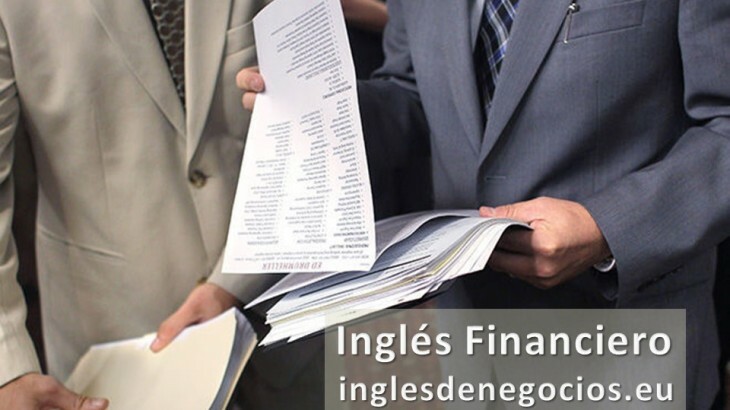 Financial & Legal aprender inglés, aprender inglés rápido, bonificada, business english, clases de inglés, clases de inglés a empresas, cómo se dice en inglés, empresa, formación, idiomas, inglés, inglés de negocios, inglés de negocios vocabulario, inglés empresarial, inglés en Granada, inglés en Madrid, inglés en Málaga, inglés en Marbella, inglés en Sevilla, inglés gratis, inglés malaga, inglés online, posts en inglés, U24Business, YouTooForBusiness. permalink. ¿Trabajar ‘for’, ‘in’ o ‘at’ la empresa?